In the age of processed food, and chemical-laden drugs from large pharmaceutical companies, having a natural eyecare product to offer patients is a competitive advantage. In my office, we pride ourselves on having Natural Ophthalmics products to prescribe and sell. Patients trust the products they buy in our office, and we know we are giving them a high-quality product that won’t irritate their eyes, rather than just sending them to the nearest drug store to see what they can find. Natural products, sold by a company you can trust, is one of the ways you create satisfied, loyal patients who are likely to stick with your practice and refer others. Using Natural Ophthalmics products as part of as an integrated holistic approach to eyecare helps differentiate your office from optical stores and other eye doctors’ offices. I am booked four months ahead, as many people want this type of natural, integrative eyecare. 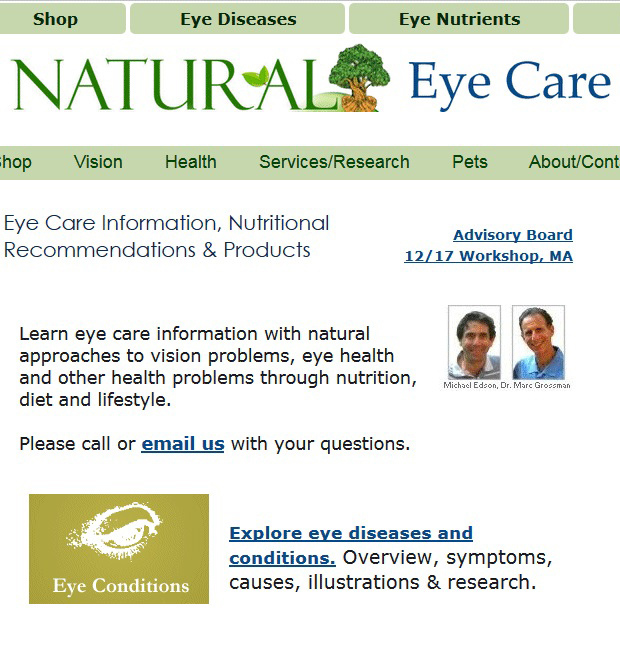 The page on Dr. Grossman’s practice web site educating patients about the natural eyecare products he sells. Dr. Grossman says patients are eager to experience the kind of integrative medicine that selling natural products allows. Patients already understand the benefits of eating food that is natural and organic, so most are primed to hear a message about the advantages of natural eyecare products. My practice devotes a special page on our web site to natural eyecare products from Natural Ophthalmics. The information we provide is broken into links to click on for specific eye conditions, ranging from blepharitis to computer eye strain, diabetic eye disease, light sensitivity, and beyond. It’s important that when you publicize the natural eyecare products you sell that you give patients the details on how specific visual and eye health challenges relate to the products you have prescribed. The patient first learns the relationship between what you have prescribed, and their eye condition, in the exam room, and then if you have a specialized portion of your web site detailing the products, you can refer them online to information you put together yourself, or personally reviewed, to learn more. The products are prominently displayed in our office on a special shelf in the exam room, so I can easily take the product off the shelf as I prescribe it, and I am personally handing it to the patient. One of the reasons I like Natural Ophthalmics is not only are the products made with natural, irritant-free ingredients, but there’s a product for nearly every patient need. My practice sells Natural Ophthalmics Women’s and Forte Tear Stimulation Drops, Allergy Desensitization Drops, Cataract Crystalline Lens Eye Drops, Ortho-K Thin and Thick Eye Drops and Floater, Cataract, Glaucoma and Macular Degeneration Pellets. We purchase approximately 100 bottles of Natural Ophthalmics products per month at around $600 monthly, and we generate around $1,200 per month from selling those products. That means we have at least a 50 percent profit margin. 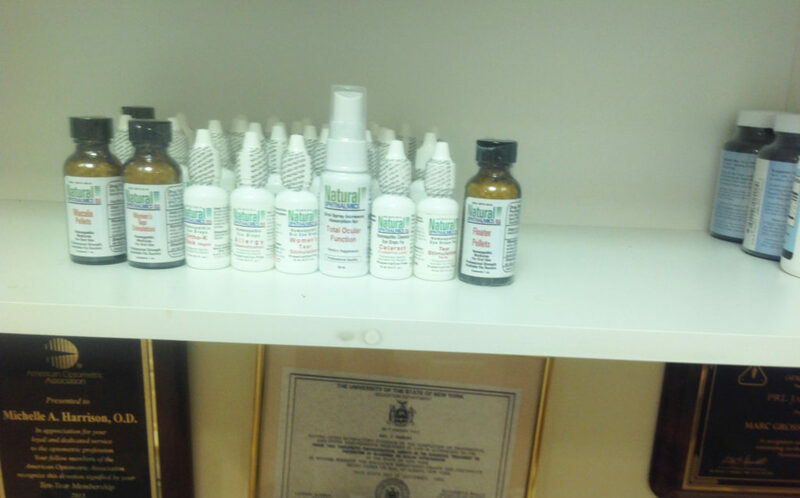 Natural Ophthalmics products on the shelf in Dr. Grossman’s office. Dr. Grossman says it helps having the products right in the exam room with him, so he can personally hand the products to patients as he prescribes them. Selling natural eyecare products in your office requires that as the doctor you stand behind the products. Fortunately, I am such an advocate of Natural Ophthalmics products that I serve on the company’s advisory board. So, when I prescribe these products, I’m being honest when I tell patients that I consider the products to be the best that I can prescribe for them. Emphasizing your personal endorsement of the specific brand of products you sell is important because doing so lessens the chances of the patient deciding to just look for something they believe is comparable at the drug store. I also explain to patients that I believe in an integrated approach to eyecare in which the eyes are seen in the context of the total health of the patient. When you believe in an integrative approach, prescribing natural products becomes more important because you know exactly what is in the products, which means there is less chance of an unknown chemical causing an unwanted side effect. It’s not enough for you as doctor to be knowledgeable about, and believe in, the natural eyecare products you sell. Your staff also needs to be on board. Getting them engaged in selling natural eyecare products means educating them about the benefits, and maybe even giving them the products to try themselves. If they try the products, and have a positive experience, they go from being fact-based experts to being personal advocates and champions. Patients can tell the difference between a disinterested voice and a passionate believer, and are more likely to purchase from a believer. In my office, we train patients to be knowledgeable about how the natural eyecare products we sell help heal patients’ eyes, give them the products to try themselves, and explain to them how the products tie into our integrative approach to medical eyecare.